September 07, 2018 at 12:38 pm. Indianapolis Colts running back Marlon Mack practiced again Friday, enhancing the chances that he may be available for Sunday’s season opener against the Cincinnati Bengals. Mack practiced Thursday for the first time in nearly a month, albeit on a limited basis. He had been sidelined since injuring his hamstring in the Colts’ preseason opener against the Seattle Seahawks on Aug. 9. Even if Mack does play Sunday, he likely will be on a pitch count. The second-year running back had just four carries for nine yards in the preseason. The 6-foot, 210-pound Mack rushed for 358 yards and three touchdowns on 93 carries as a rookie. He also caught 21 passes for 225 yards and a score. With the departure of veteran running back Frank Gore to Miami, Mack was expected to take over as the starter this season. Indianapolis has a pair of rookies behind Mack in Jordan Wilkins and Nyheim Hines. 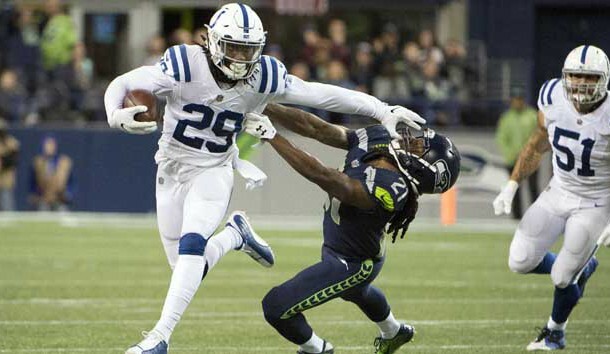 Former Seattle second-round draft pick Christine Michael is the most experienced back on the active roster for Indianapolis. Running back Robert Turbin will miss the first four games of the regular season for violating the league’s policy on performance-enhancing drugs. If Mack is not ready for the opener, Wilkins is expected to get the starting nod. A fifth-round draft pick out of Ole Miss, Wilkins rushed for 1,011 yards and nine touchdowns on 155 carries in 2017. He rushed for 75 yards in the preseason.